"Courage: the ability to do something that frightens one"
Does your little girl face things that she's scared of on a regular basis? Maybe she's scared to leave you and go off to join her Kindergarten classroom but she still does it. And by the end of the day, when you're there to pick her up she's greeting you with that sweet grin and a hug. That's courage. Maybe her lip trembles when the doctor has to give her a shot but what do you see when you look into her eyes as she's sitting on the paper covered table? Courage. As cowardly as the lion of the Oz stories may have been, once he met Dorothy's crew he knew he needed to face the world with this rag-tag team, no matter what scary things might be lying in wait for them in their journey. When it came to facing the obstacles ahead, though he might have been afraid, the cowardly lion stuck with his friends. Turns out the lion had more courage than any wizard could have given him all along. Whether your courageous kid is dressing up for a school play or for Halloween this lion costume is simply adorable. The fur collar looks like the illustrations from the original 1900 books. 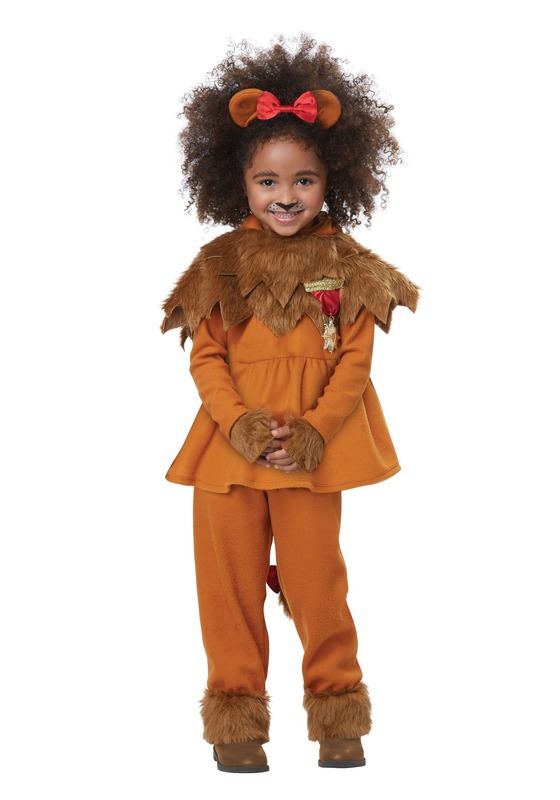 Your little one will love the medal of courage and the swishy lion tail in back. Now she'll always know that even if she's a little scared she's still got courage!